Possibly the greatest quote of all time was when George Lucas said Stars Wars can not be converted to Blu-Ray, because "they are too old". Just think of that for a bit while I watch Wizard of Oz and Gone with the Wind in high-def. Well the good news (besides me already having 50 followers. Thanks guys.) is the complete Star Wars collection is finally coming to Blu-Ray in a massive 9-disc set on September 12. The bad news, this will contain only the "special editions" of the original trilogy. This news seems to shock some people, but I've come to expect disappointment by now. When Terrorist aren't getting killed, this blog is going to focus on comparing sequels and such. But I will stay away from Star Wars simply because everything possible has already been said. The originals >>> the prequels. That is a fact at this point. Anyway, let's look at the bright side. Six of the discs each have a movie and commentary. The late director of ESB, Irvin Kershner, was able to provide (presumably) new commentary, and Carrie Fisher is the only actor to add her input. Two of the discs feature tons of deleted scenes for each trilogy, some of them brand new and some have been locked in the archives for 30 years. The last disc, and possibly the best looking one, has several documentaries. There's one for each of the original movies, each untouched from 77-83. There's a brand new Talk with the Masters, featuring Lucas, Kershner, writer Kasdan, and John Williams. One is based just on Star Wars Universe tech, one just on fandom, one just one spoofs, and one just on...Dewbacks. Here is Wikipedia explaining the differences between each film revision. Here is the first part of Mr. Plinkett's incredibly well done, incredibly funny, incredibly raunchy, and incredibly long (Episode 1, the shortest one, is 70 minutes) reviews of the prequel trilogy. Well worth the time. 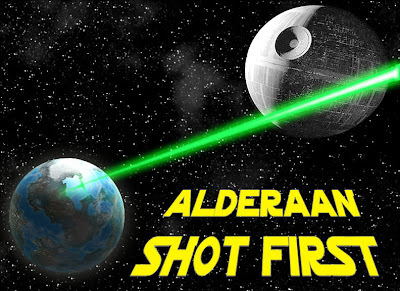 And Here is the first part of Star Wars Begins by Jambe Davdar. It is an incredibly impressive fan commentary of the original trilogy that takes the entirety of the movie, and splices in archive scenes, raw footage, interviews, and other stuff. It's very informative and also well worth your time. thats a good advancement in the star wars industry, although ive never been a fan. congrats on 50! Congrats on 50, I (by some miracle) haven't seen any of the Star Wars series and I think Blu-ray would be a good place to start! I'm curious to see if it's the jap laserdisc version that makes it to blu-ray. i feel sorry for people that have re-bought it so many times. I'll finally pick up these blu-rays. Glad I didn't buy VHS, then DVD, only to have to re-buy these. I so need a BluRay-Player. May the 4th be with you! Read about this yesterday, great news. Shame about the (very much expected) changes, though. Glad I've held out on buying any editions over the years, because I'm definitely picking this up. What's the price on these again? I am a big Star Wars fan and will definitely have to get these. too good. But Who Will Play Obama?